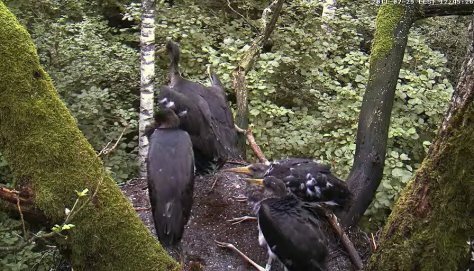 Yes, the oldest of the black stork chicks is out of camera view in daytime. Wings were exercised for several days; the storklet probably hangs about on some branch in the nest tree. A world waits to be discovered when one’s wings carry. If the camera doesn’t open, please try using the webplayer via the drop-down menu at the top of the page. Urmas and Renno changed the batteries at the nest camera, and so the camera is on line all the time.